The smart way to sell vehicles online. NetDirector® Transact is a dedicated, end-to-end ecommerce solution for the automotive industry. Through our NetDirector® Auto-e platform, it enables retailers to facilitate part exchange services, deposit or full payment processing, finance applications, and delivery confirmation. In just four easy steps. A completely responsive, user-first solution dedicated to ecommerce. Vehicle buying behaviour is evolving. Ecommerce is set to become a mainstream part of our industry. 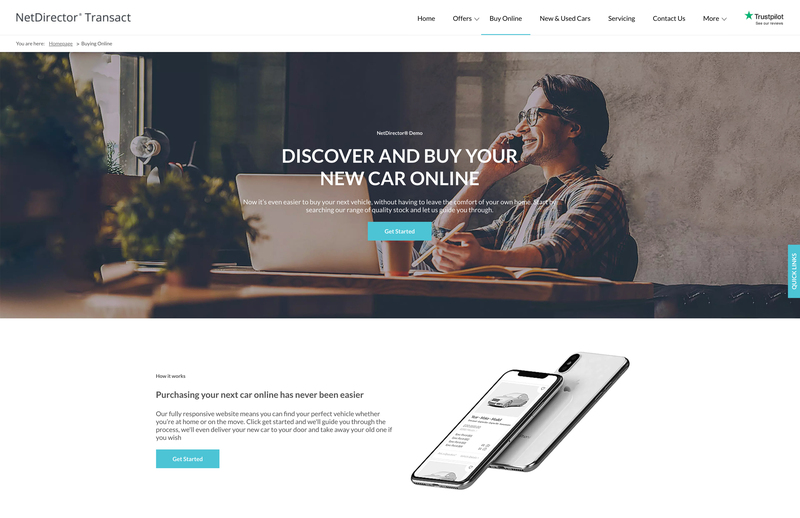 97% of consumers start their vehicle buying journey online, and 67% of mobile users are willing to commit to completing the purchase online too*. NetDirector® Transact will help you embrace ecommerce and prosper in a new era for automotive retail. NetDirector® Transact also enables consumers to feel in control of their buying journey, regardless of how they choose to buy their vehicle. NetDirector® Transact will give you a crucial advantage as your customers adapt to the convenience of purchasing products and services online. With NetDirector® Transact, retailers can keep the entire buying journey on their own site without involving a third-party. NetDirector® Transact is not a generic ecommerce solution that has been merely adapted for automotive. It has been built from the ground-up with our industry in mind. This means it can handle the complexities of each stage of the buying journey, such as evaluating part exchange vehicles with outstanding finance, personalised plate transfer, and even cashback on finance deposits. Deliver an optimised experience that combines your brand, support channels, and a complete user purchase journey with NetDirector® Transact.